3.2.4 Inspect the Tokens "innen" and "bu" kwic(). 5 Rebuild the Corpus without Tweets with lang=="tr"
Please see Twitter pt. 1 for Twitter Mining with rtweet and the details of the data handling approach. 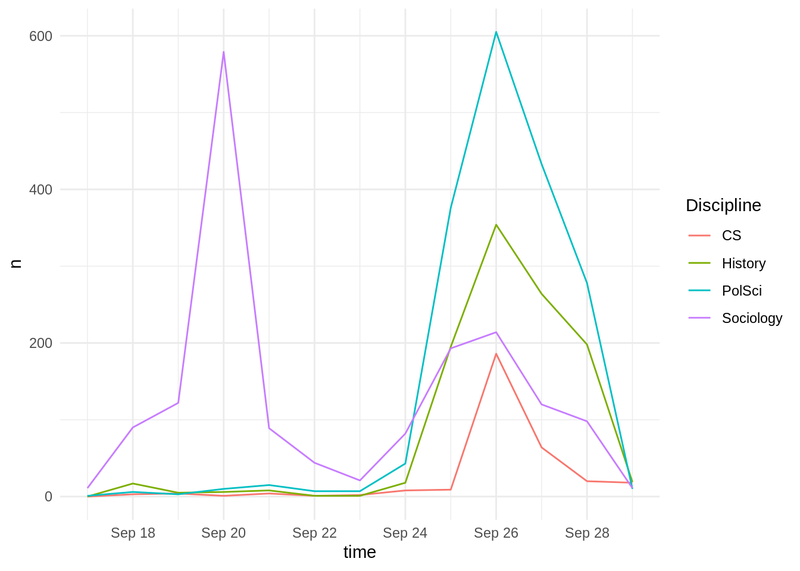 Something I didn’t account for last time, was the possibility that some Twitter Users might have been mentioning / monitoring multiple conferences, esp. with regards to the interrelation between Political Science, Sociology, and History. Let’s single them out and assign a “Mixed” label. Only 42 Tweets? Out of a sample of almost 5K? Twitter Silos, anyone? 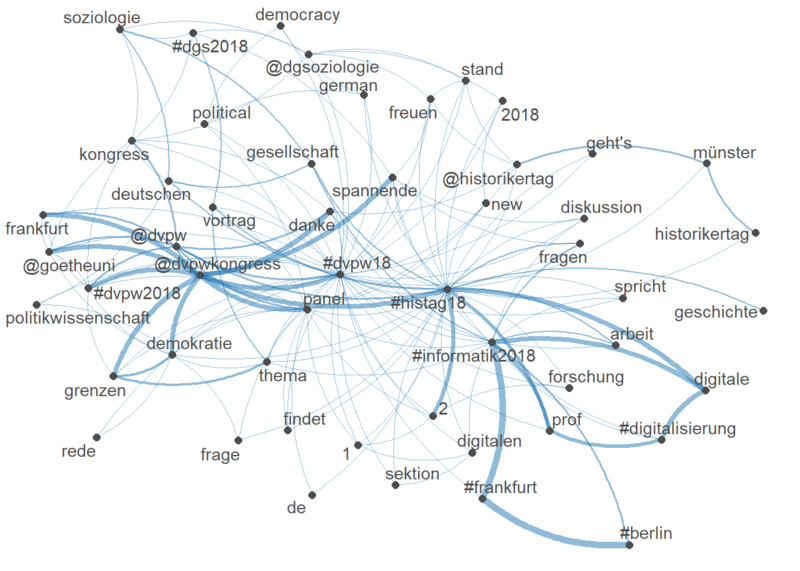 Meine Wunsch an #ScienceTwitter jetzt wo #dvpw18 &amp; #HisTag18 &amp; #dgs18 parallel laufen: Kann jemand analysieren, wie viel Schnittmenge es zwischen den Programmen gibt? For further, “Corpus-based”" analysis (and beyond) we’ll use the quanteda package. I aim to re-do as much as I can from this series with Julia Silge’s tidytext package, soon, btw. As we already have singled out “interdisciplinary” Tweets, we’ll just anti_join() every other tibble with the mixed Tweets. That’s even easier thanks to Quanteda. For most really usuful approaches to “text as data” we’ll need a sparse document-feature matrix (dfm). Doing this with quanteda is straight forward, but there are some less prominent Tweets. We get nfeat(joint_dfm) = 20832 features, but as we can see from the topfeatures() output, the top features are mostly (and unsurprisingly very common German words which are also know as stopwords in NLP). Also, note how stopwords("german") consists of 231 tokens. Just for comparison, tidytext::stop_words has a total of 1149 stopwords for English. So we probably will have to include custom stopword lists repeatedly. Great. But … what is “amp”??? # This way, we'll keep our custom "amp" and "innen"
That’s better. But what’s up with “innen” and “bu”? Ok, so "< / | * >innen" is part of the gendered forms of plurals of German terms such as Colleagues, Citizens, Rassists et al. We might want to think of a robust solution - which should not be stemming - here. Maybe ngrams=2 or some clever str_c(<regex> + (* | /) + "innen"") might help. But for now we’ll just add "innen" as a stopword. otomatik olarak yapıyorsa bu bekleyiş neden ? , DGS neden bu kadar itibarsızlaştırılıyor ? Turkish? Huh? 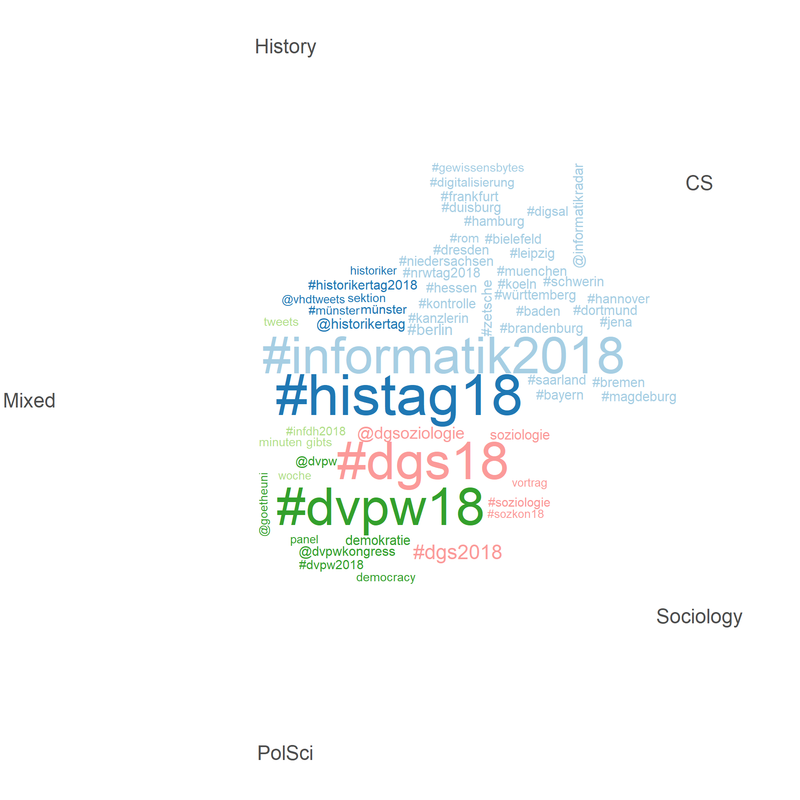 Seems like the Sociologists’ hashtag (#dgs18, #dgs2018) was heaviliy used by the Turkish Twitter community, too. Yikes! So my result from the previous post were totally biased in favour of the Sociology Conference. And what language is "und" and what about the joint collection? lang == "tr" and lang == "und" definitly need some closer inspection. Key Learning: I could have avoided stepping into this trap if I had plotted the distribution of Tweets over time… Exploratory Data Analysis FTW. See that left peak around the 20th? Arghhhh! Ok, that’s already better, but there are still 92 Turkish Tweets in the sample, and 120 Tweets for lang == "und". Let’s have a look at the remaining Turkish Tweets and then rebuild our corpora and the document-feature matrix. #dgs2018 derslerden muaf olmak için en çok 5 yıl önce ilgili programdan mezun olmak gerekir şartı var mı arkadaşlar????? Bilen birisi bilgilendirsin lütfen. #dgs2018 AÖF lisans dersleri DGS muafiyetinde kullanıyor mu?? But who’s going to tell the German Sociologists that my report from last week had to be corrected and that they didn’t perform that well, actually …!? Key learning: Never rely on blind/nummeric analysises only. Always do some qualitative exploration and check for plausibility - even when it’s “only” for a blog!!! That’s a difference of another ~30 Tweets. Nice. We’ll use that in a minute. However, if you have been jumping back and forth within this post (or .Rmd Notebook), then you (=me) might have lost track of the various manipulations and state differences (i.e. think of custom_stopwords). 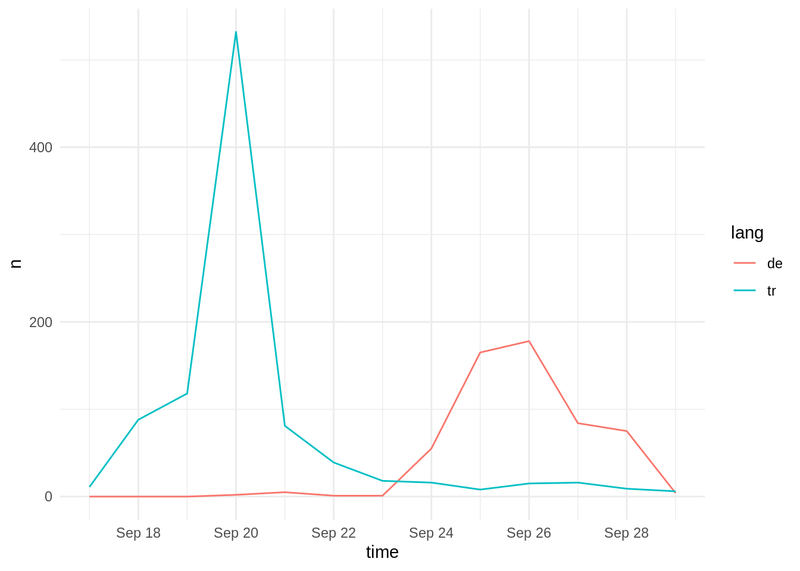 Plus, the dgs_corpus would still need attention, too, and as we’ve filtered out a lot of Tweets by setting a lower time limit, the common time period for the corpora would differ, too. BAD! So let’s rebuild the corpora from scratch. We’ll just add filter(created_at > "2018-09-23") and for the sake of robustness, we’ll filter all corpora for lang != "tr", and anti_join(dgs_corpus) with tr_user. As I want both, discipline-specific copora with “multidisciplinary Tweets” and a redundancy-free joint corpus, I’ll build the corpora in two steps. ## not totally sure about the effect of setting text_field = "text"
corpus(docid_field = "status_id", text_field = "text") # 42 docs! Of course, eventually, we should update and rm() all the obselete *_collection objects or simply consolidate all the “valid” Tweets in a .rds file. However, I’m not so much into editing raw-ish / original data, so doing that is up to you. ## Elapsed time: 0.58 seconds. We’re down to 15763 features from 3748 documents (Tweets) and were able to get rid of 608 features with the iteratively refined approach. And as we might want to use a grouped dfm for group comparisons (and dfm_group doesn’t seem to work for me here), we’ll create a custom grouped one, too. There are still a couple features which would qualify for being removed (such as “unsere”, “mal”, “schon”), but we will take care of that with the super-useful quanteda::dfm_trim(<term_freq>) threshold-based feature selection. However, I learned a lot doing this today, and I hope that it became obvious that dealing with text as data is not to be underestimated.